Lots of full-color photos and little bit of prose celebrating the unique ecosystem of an American Ginseng habitat in the Arkansas Ozarks. 77 pages long, size is 8.5″ x 11″ to allow for easy printing at home. The paperback edition is available from most retailers. More than 70 photos of woodland nature, American ginseng, ginseng habitat & companion plants! This is not a “how to” book. But if you’re trying to identify American ginseng and the habitat it prefers, this book is a valuable resource. With more than 50 photos of the plants, and the most common look-alikes that grow in the same environment, it will help you to identify the kinds of places your wild or wild-simulated ginseng will thrive. What are the plants that grow in a ginseng habitat? This book shows many of the ginseng habitat companions, also called “ginseng indicator plants”. So many of the plants that grow in the same ecosystem are fragile and beautiful. Many are rarely seen outside of the specific conditions that support the growth of plants such as ginseng. 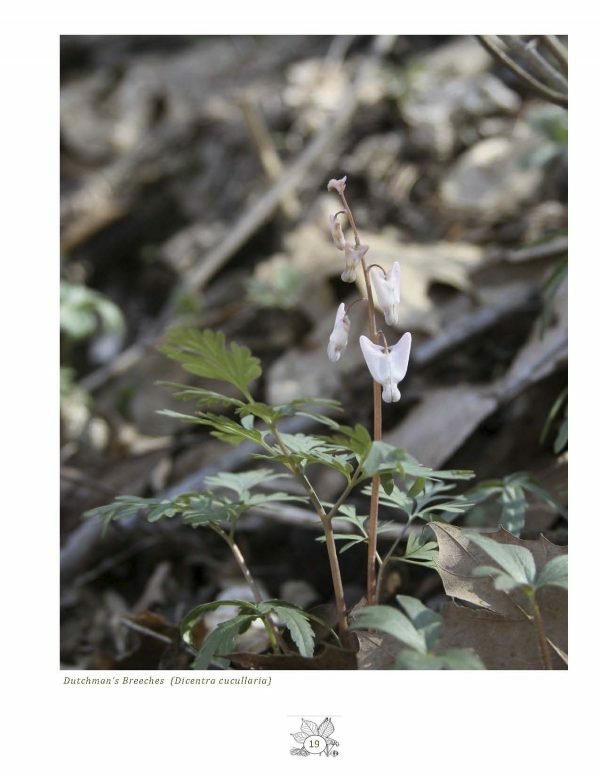 This is a sample of a page from the book showing Dutchman’s Breeches, one of the plants from an American ginseng habitat. If even one tree is removed from an ecosystem such as this one, it impacts so much. Ginseng cannot live in bright sunlight, and neither can many of the other plants that inhabit the same space. It is possible to restore a former habitat to conditions to support and encourage regrowth. Plants and seeds can be spread to repopulate the forest. This book will help you to see how the environment should look – how the ground cover looks, what plants grow there, and impart a sense of familiarity with the unique space called an American ginseng habitat. These photos will cultivate a sense of awe and wonder at the ephemeral beauty that lives in an American ginseng habitat. You can download and print your own with my PDF file, but paperback and e-book is available from most retailers. Click the photo to find one!